"The Holy Monsters," set in a hospital, depicts scandals of desire and money. (ep.1) On a raining night, a car pulls over in front of Okubo Hospital. Someone from the car takes out a pregnant woman from the car and lays her on the ground. Chief nurse (Miki Nakatani) watch from a window. After the car leaves, Yuka Kasugai rushes to the pregnant woman with other nurses. Nurse Yuka tells staff that the pregnant woman isn't a patient at Okubo Hospital. At this time, Kengo Shiba (Masaki Okada) is at the hospital and the only doctor available. Dr. Kengo Shiba is hesitant to perform a Caesarean section, because he has never done such a procedure before. Yet, Nurse Yuka pushes Dr. Kengo Shiba to perform the surgery. The baby is born safely, but the mother dies. Dr. Kengo Shiba will learn that this wasn't random chance, but all part of a plan. A year earlier, Kengo Shiba works as a surgeon at the General University Hospital. Kengo has a father, who raised him alone, and works as a barber. Kengo's mother died when giving birth to him. Even though Dr. Kengo Shiba is skilled as a surgeon, because of his righteous character he is sent Okubo Hospital, an affiliate of General University Hospital, but the hospital in poorest financial condition. During his first day at Okubo Hospital, Kengo Shiba works with young and confident chief nurse Yuka Kasugai. The director of Okubo Hospital is Shiro Okubo (Fumiyo Kohinata), a doctor who gives top priority to patients rather than worrying about the bottom line. This is partially why Okubo Hospital is in debt. Meanwhile, pregnant Keiko Fuga (Ai Kato) and Toshio Fuga (Hiroki Hasegawa) are having their wedding. Keiko Fuga starts to bleed and passes out at the wedding. When Keiko Fuga wakes up at the hospital, her husband tells her that she lost the baby and the doctor had to remove her womb, due to continuous bleeding. Keiko Fuga is devastated. Later, she goes back and tries to work for Toshio Fuga. Her husband Toshio Fuga comes from a wealthy family. He is ambitious and hopes to build a successful franchise of schools. Toshio consoles his wife that he is happy even without a child. Toshio has a son from a previous marriage. Keiko visits her older sister Yuka Kasugai at her apartment. Yuka Kasugai and Keiko Fuga are the only family members left after their parents passed away. Yuka Kasugai supported Keiko until Keiko graduated from college and began working as a teacher at a kindergarten school run by Toshio Fuga. Yuka Kasugai could not attend her sister's wedding because of work. Keiko tells her sister what happened at the wedding and that she lost the baby and can't have another child. Keiko tells her sister that she needs to have a baby with Toshio Fuga and asks her sister to become a surrogate mother. Yuka refuses, telling her younger sister that it is illegal in Japan. Later, Yuka visits Keiko at her mansion. Yuka meets her brother-in-law Yoshio Fuga for the first time. Keiko comes down the stairs. Keiko's mother-in-law and Toshio's son also come in and say hello to Yuka. Keiko's mother-in-law tells Keiko that she should focus on business only, because they already have a successor. After her mother-in-law, husband, and son leaves, Keiko tells her sister that she can't be happy without a child of her own. 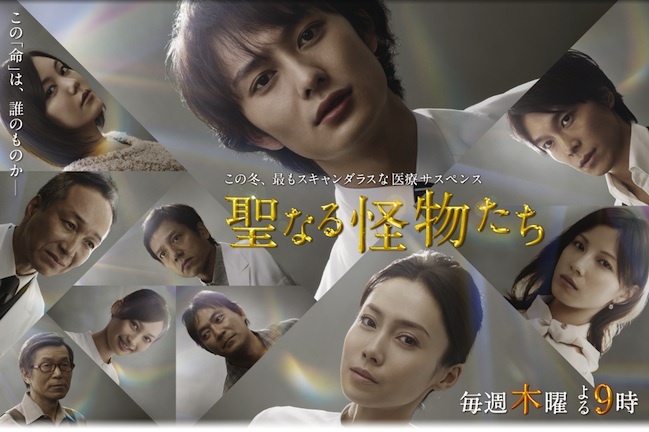 Based on Len Kawahara's medical-mystery novel "Seinaru Kaibutsutachi" (published May 10, 2011 by Gentosha).